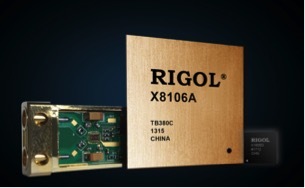 RIGOL Announces new Custom Chipset and Oscilloscope Architecture. Beaverton, OR - June 23, 2017 - Today RIGOL Technologies continues its 19 year history of Test and Measurement innovation with the announcement of its new Phoenix Oscilloscope chipset and the Ultravision II oscilloscope architecture. These technology innovations, years in development, will help transform the RIGOL portfolio allowing RIGOL to address the needs of higher performance applications. There are three chips in the Phoenix chipset (each named after stars in the Phoenix Constellation). The Analog Front End Chip(named Beta Phoenicis) will allow for front end bandwidth of 4GHz with highly integrated capability allowing for simplified and highly reliable front end design. The Signal Processing Chip (named Ankaa) supports 10GSa/s sampling with bandwidth up to 6GHz and the Probe Amplifier Chip (named Gamma Phoenicis) will support a 6GHz Active Differential probe. The ASICs are based entirely on RIGOL IP and were developed entirely inhouse. "Over the past 19 years RIGOL has proven ourselves to be an innovator in the Basic and Value segments of the Oscilloscope market" stated Rico Wang, President of RIGOL Technologies, "but with the introduction of this new chip set, developed through years of painstaking research and development, RIGOL will now be able to bring the RIGOL value proposition to more performance oriented applications." The Phoenix Chipset enables RIGOL to revolutionize its scope performance with the new UltraVision II architecture. These enhancements will lead to products with significantly faster waveform capture rates, new filtering and triggering capabilities, and unprecedented memory depths and search capabilities. 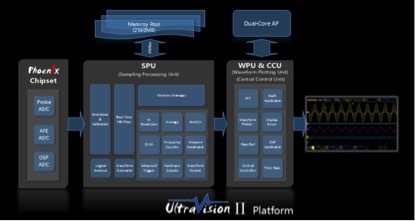 When combined with the HW performance of the Phoenix Chipset, Ultravision II will transform the customer value proposition in the 1-4GHz oscilloscope market. At the chipset launch review in Suzhou China RIGOL demonstrated its prototype scope utilizing Phoenix and Ultravision II. With 4GHz Bandwidth, 20GSa/sec realtime sample rate and 1 Billion point memory depth it shows that there will soon be a new player in the performance oscilloscope market. Mike Rizzo, General Manager of RIGOL North America says, "We are very excited for the introduction of products utilizing the new Phoenix chipset. It will allow us to bring our unique RIGOL price performance value proposition to a new class of customers needing advanced instrument performance and application support. RIGOL will formally announce our first products utilizing the Phoenix Chipset before the end of 2017 with initial customer shipments planned in Q4 2017."